Although the whole of the River Medway was polluted several years ago, fish have now re-established themselves and the water is well-stocked with roach, chub, dace, bream, carp and bleak. 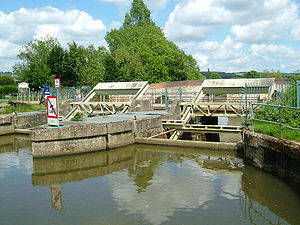 Free fishing is found upstream of Allington Lock, through the centre of Maidstone, to Farleigh. The river at this point is approximately 100ft wide and 18ft deep in the middle, with a slow, steady flow except when the lock gates are opened. Most fish are caught by trotting with maggot and caster. Access is simple from the numerous roads that lead down to the towpath. From Farleigh to Yalding the water is controlled by the Maidstone Victory Angling Club which issues day tickets (except Sundays) for a stretch on the north bank from Teston to Barming. Access to Teston is from the A26 Maidstone to Tonbridge road. 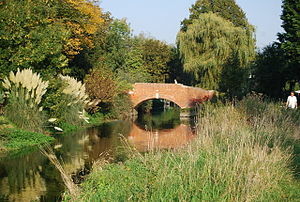 From Yalding to Ford Green Bridge the water is controlled by the Paddock Wood Angling Club and is for members only. Above Ford Green Bridge fishing is controlled by Tonbridge Angling Society, as is all the water through Tonbridge upstream to Ensfield Bridge. Much is reserved for their own members but day tickets are issued for a stretch of nearly three miles from Eldriges Lock to Cannon Bridge on the west bank, and half a mile on the east bank from Cannon Bridge to Works Lock. Access is from the A26 and several side roads. At this point the river has easy banks, with very little vegetation, slight flow, and an average depth of 8ft in the middle. Other day-ticket water in the area includes the recreation ground in the middle of Ton-bridge and the shallows south of the town. Then the river up to Ensfield Bridge is for members only. stretch is a productive one, but can have busy boat traffic on it during the summer months. The River Rother acts as a drain for the water on Romney Marsh, taking it through lock gates and hence to the sea at Rye. Through its entire course it holds a very good head of chub, roach, bream, carp, and a few tench and pike. Shoals of mullet and sea trout are contacted on most baits; the rod-caught record thin-lipped mullet (5lb 11oz) was taken from this water. Rye and District Angling Club controls much of the lower end of the river from Star Lock just outside Rye to Newbridge on the B2082, and then from Newbridge along the west bank for the first four fields upstream. Above this, the Rye and Clive Vale Angling Club controls the water as far as Blackwell Bridge, Wittisham Lane. From there fishing on the west bank from Star Lock to Iden Lock, and on the east bank from the first field above Newbridge is free. The Rother Fisheries control the next half mile on the east bank and above this, the stretch to Blackwall Bridge and beyond belongs to the Rye and Clive Vale Angling Club. Newenden on the A28 Hastings-Tenterden road is controlled both up and downstream by the Rother Fisheries, while upstream Sandhurst on the A268 Rye-Hawkhurst road is controlled by the Rye and District Angling Club. At Bodiam Bridge just off the A229 Hastings-Hawkhurst road, the Bodiam Angling Club has water up and down-stream, and the Rother Fisheries control the water from Salehurst Village to Robertsbridge, which is on the A21. The only club on this water to issue day tickets is the Rye and District Angling Club who charge £1 per day for the waters they control. Tickets are obtainable from the cottage at Iden Lock or from the bailiff on the bank. The Stour flows straight into the open sea at Pegwell Bay and is tidal as far as Fordwich. From Canterbury it flows through open marshlands, the banks lush with vegetation but with very few trees and bushes. Famous for its quality roach and large head of bream, chub, barbel and grayling have recently been introduced, but most have gone upstream to the faster and shallower water. The water also con-tains large numbers of roach/bream hybrids and a run of sea trout which would be better if it were not for the pollution caused by the industries downstream of Sandwich. Mullet travel upstream well above Grove Ferry and there are occasional reports of salmon. 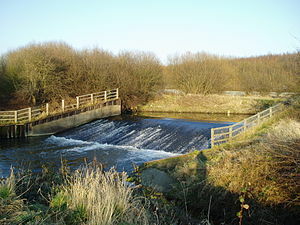 Society controls the fishing rights from here to Plucks Gutter on the B2048, and day tickets are obtainable on the bank. From Plucks Gutter to above the Mill Pool in the village of Sturry the water is controlled by the Canterbury and District Angling Association. Access is by the A28 Canterbury to Margate road and then down to the river from Grove Ferry and Cut End. Day tickets are available at £1 from the bailiff on the bank. From Grove Ferry to Fordwich is for club members only, and from Fordwich to Sturry is fly fishing for trout, also members only. 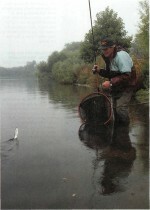 Fishing is excellent for chub, dace, roach and bream, with the occasional grayling and barbel. Upstream of Canterbury the river is either privately owned or syndicate-owned and reserved exclusively for fly fishing.